I am not a trekker. Don’t get me wrong. I am not lazy. 😛 I can walk miles and miles. 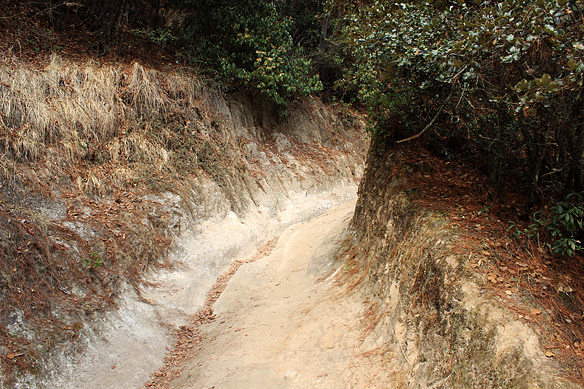 But walking on level ground and up boulders, shrubbery, and running streams are two very different things. My excuse is that I spend most of my time in large metropolises. I am aware it is a weak argument. I know many, way more urbane than me, who sip their wines amidst swirls and dress as if they’d just stepped out of a fashion glossy, able to clamber up a mountain with equal ease. How do they do it??? I’d love to be able to. Truly. But that has not stopped me from attempting climbs and treks which are universally accepted as being spectacular. And doable. 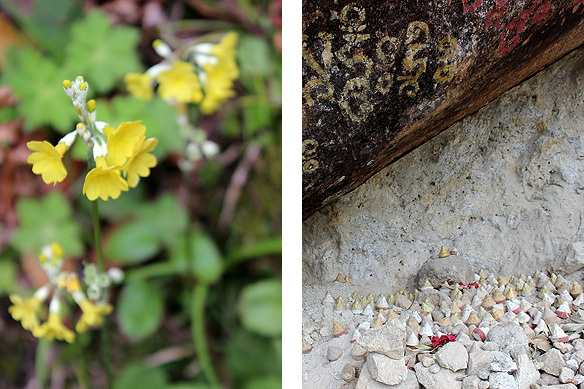 Taktsang Trek was one such. 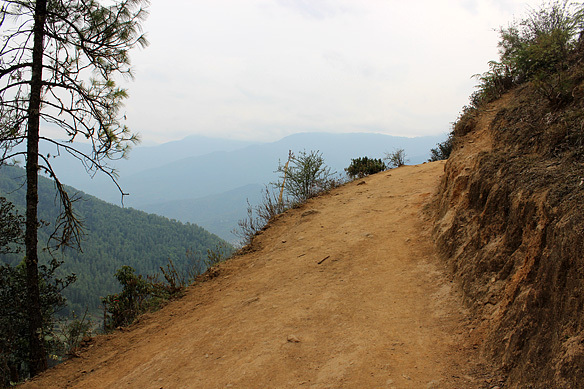 You really cannot go to Bhutan, and not do the trail. It would be sacrilege. So how does someone like me, and you—if you are like me—do it? At leisure, for one. It took me a whole day [I started early in the morning] with photo stops every 30 minutes to do a climb which guide books say can be done in 4 and a half hours return. And two, I cheated. A bit. I took a mule to the mid-point on the way up. My mule, christened Mindu was as much of a leisurely wanderer as me. Every now and then he would stop to take in the view. So there we were, Mindu and me perched on precarious rocks looking out at the gentle chequered Paro valley spread out below, well aware that one misstep and we could both go to heaven. Or hell. Whichever you prefer. But, it was the charms of the present moment which engulfed us. And a sacred Buddhist monastery called Tiger’s Nest which called out to us. Hence, we continued to trudge on. “Take nothing but memories, and leave nothing but footprints.” A large sign with responsible trekking guidelines greets one at the base Ramthangkha. The trek is 3 miles or 4.82 kilometres long traversing steep granite cliffs, starting at 900 meters above sea level to an altitude of 3,120 meters. Going up, is literally going up, with many parts near vertical climbs, and acclimatization to the altitude, and the inevitable gasping for breath a need of the hour. Coming down, it culminates mostly as skidding through slippery sands, and if it were to rain or snow, then through slush. But that’s the gory side. 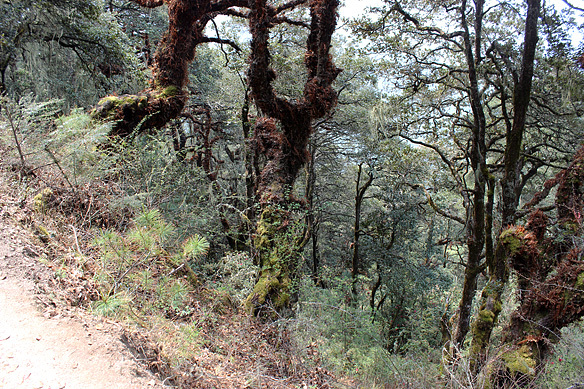 On the more scenic, gentle side, the cliffs are blanketed in towering blue pine trees and jewel-like prayer flags with alpine flowers and rhododendron clinging to the earth. 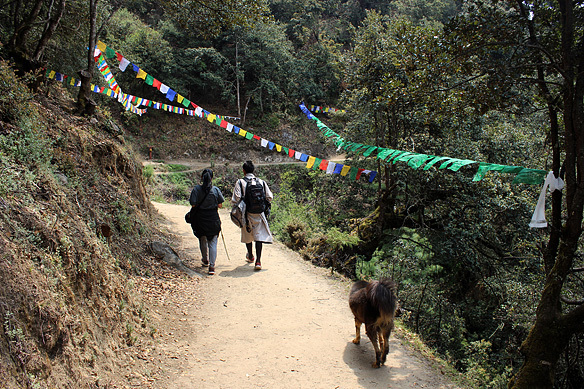 For company I had red-robed monks from Ladakh and Tibet, 6 and a half feet tall European trekkers, fervent devotees from the Far East, giggling Bengali college students, elite urbane Indians, local Bhutanese in local attire, and the odd mountain dog. There were 2-year-olds and 80-year-olds, and many in between. 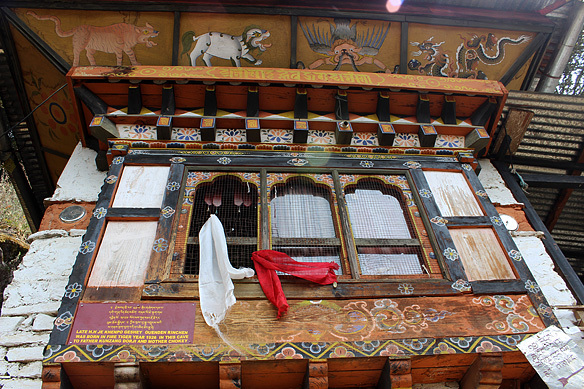 Halfway up, a huge prayer wheel greets the trekker with a track leading to the cafeteria and clean bathrooms. Both, a welcome break. But if you choose to lumber on ahead, coz you already low on time, like I was, then stick to the main path. You don’t want to be stuck in the mountains in the dark! The undulating trail ends in around 750 steps, punctuated with a waterfall and cut into the cliff face, first plunging deep into the valley and then rising, almost like a phoenix, to the entrance of the monastery. 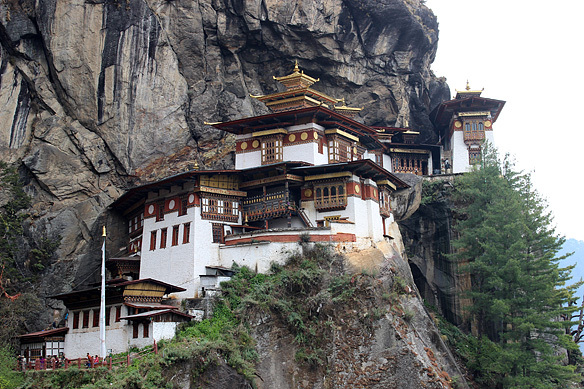 Suspended at a height of over 3,100 meters, Taktsang Palphug Monastery or Paro Taktsang as it is more commonly called, is not just a place of worship and interest, but is the very fountain head of Bhutan’s cultural wealth and identity. It is a legacy which links the country’s past with its present, as well as its future. 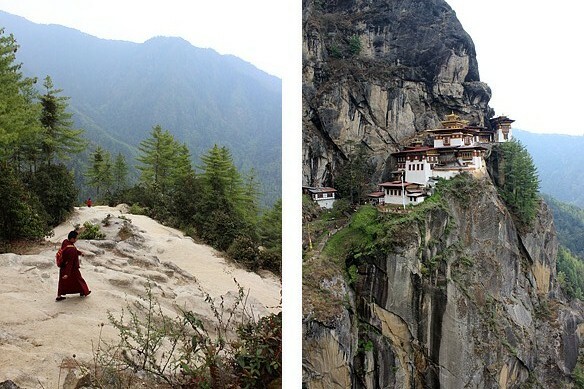 Taktsang is considered to be one of the most holy sites of the Thunder Dragon Kingdom. 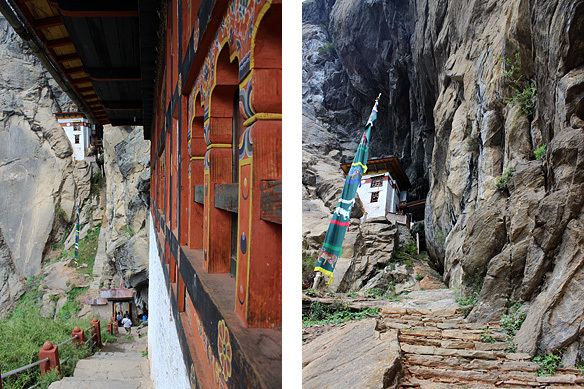 According to legend, Padmasambhava, the Indian saint who brought Tantric Buddhism to Bhutan in the 8th Century flew into a cave here, riding a tigress. Back then, the area was believed to have been infested with evil spirits who tortured the local people. 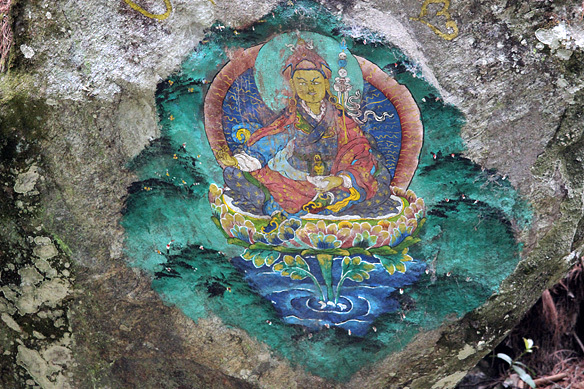 In this cave, Padmasambhava took on the form of Guru Dorji Drolo, one of his eight manifestations, and slayed the demons. He then went on to meditate at this very place and reveal the secrets of the mandala to his followers, who in turn spread Buddhism in the country. When the neighbouring residents came to the cave, they were met with a real tigress. 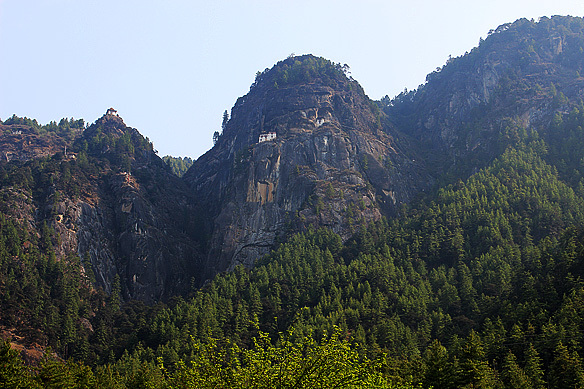 The cave has since then come to be known as Taktsang or Tigress’ Lair or Tiger’s Nest. The foundations of the monastery were built in 1692. I had over an hour and a half at the monastery. What bliss! A cortège of gold roofed lhakhangs piled up on each other, reached by narrow wooden ladders and steep steps (often a foot high) comprise the part of the monastery open to the public. Golden, brightly robed effigies of deities and lamas are the focus of chantings and lit yak butter lamps in little rooms painted from ceiling to floor with Buddhist stories and teachings. There is another whole section to the back, where the monks live, chant and meditate, uninterrupted for centuries. Wear hiking or trekking shoes. Use a walking stick. It helps on the 750 steps. All visitors are requested to wear decent and proper clothing. Bhutanese visitors must be in national dress. You are required to register at the entrance before entering the monastery. You are required to leave your phones, cameras and backpacks at the entrance. Photography is strictly prohibited inside the monastery. Hoisting of synthetic prayer flags along the trail is prohibited. Cycling along the trail is prohibited. Eatables are not allowed on the steps leading to the monastery. Alcoholic beverages, tobacco products and toxic substances on the trail are prohibited. If you come across any non-bio degradable garbage or waste along the way you are requested to collect them and dispose them in the dustbins provided along the trail. 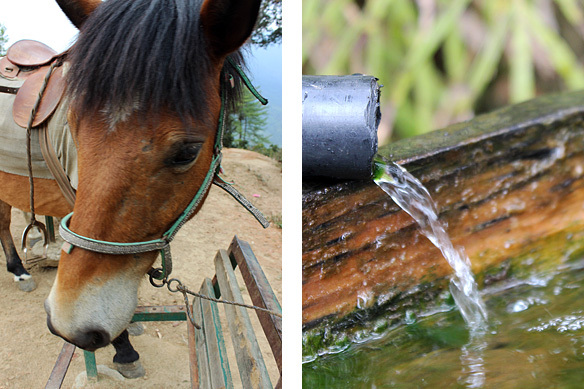 Note: Mules are only available for going up to the mid-point; not any further or for coming downhill. The half-way, one-way ride costs around USD10. 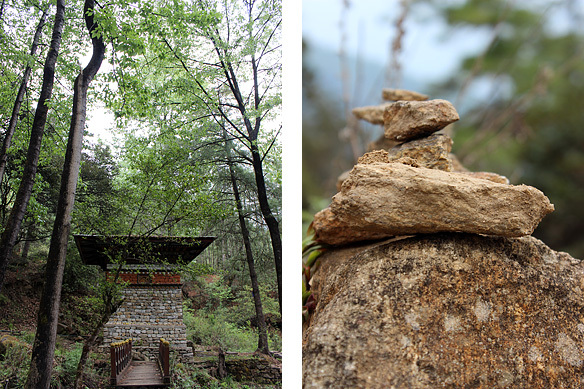 Note: My road trip to Western Bhutan was done with Doreen D’Sa, Doe’s Ecotours. This entry was posted in Bhutan, Exploring our World and tagged Bhutan, Guru Rinpoche, Padmasambhava, Paro Taktsang, Taktsang Palphug Monastery, Taktsang Trek, Tiger’s Nest, Trekking Guidelines, Yeshi Tsogyal by Rama Arya. Bookmark the permalink. Rama I enjoyed reading your post. Thank you, chinumeenu. Welcome to my blog. Am happy you found the post useful. 🙂 Do stop by again. Yes I find this blog with interesting places to be hence will visit this place again. Thank you for the invitation. It was really lovely to go down the memory land and relive the experience. 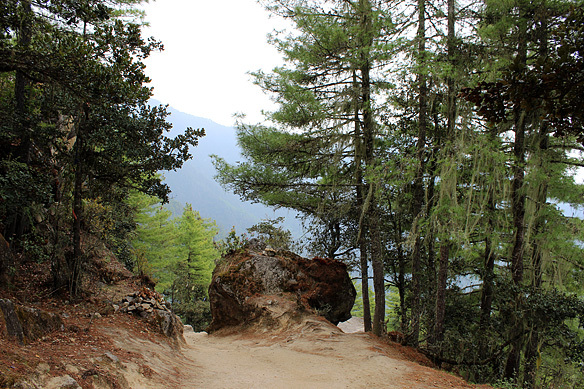 One more tip for the non trekkers, start early in the morning so that you can comfortably come back by the evening. No eatables are allowed up the steps when you reach the monastery. Being a non trekker myself, I am really proud to have accomplished this journey. Thank you for stopping by, pursueincome, and commenting. Glad you liked my blog. 🙂 I read yours as well–it is pretty neat too.